Tourist arrivals from China are likely to see significant growth following an assurance from provincial tourism authorities in China. The tourism administration of Zhejiang Province in China has given an assurance that every effort will be made to increase visitor arrivals to Sri Lanka by at least 25%. This assurance was given by Chairman, Ningbo Municipal Tourism Administration, Mr. Li Zhemin to Minister of Tourism Development, John Amaratunga during a meeting at the Ningbo International Tourism Expo yesterday (3). The Expo has around 300,000 visitor participation and is one of the leading travel events in the country. Incidentally this was the first time that a tourism delegation from Sri Lanka visited the Expo in a province that generates over 60,000 arrivals to Sri Lanka each year. 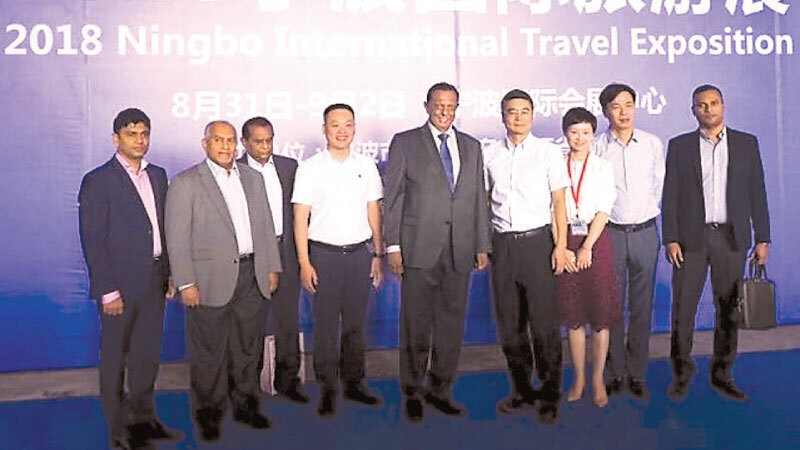 Minister Amaratunga and delegation visited Ningbo International Tourism Expo on 2nd and 3rd September and met a cross section of the travel and tourism industry in Ningbo Province. The delegation also met important officials from China International Travel Service (CITS) including its General Manager, Mr. Ke Hai Shui where matters relating to tourism development were discussed. It was noted that the excellent air connectivity between the province and Colombo was an added boon in promoting tourism in the region. Minister Amaratunga who spoke at length on Sri Lanka’s authenticity, diversity and compactness as a destination took the opportunity to invite all leading travel companies in Ningbo to visit Sri Lanka on a familiarization tour and experience what Sri Lanka has to offer. Meanwhile Sri Lanka Tourism Promotion Bureau in association with China International Travel Service (CITS) conducted a very successful Road Show at the Marriot in Ningbo yesterday (3). Over 300 tourism stake holders participated at the event including leading travel agents in the region. Minister Amaratunga also participated in media interviews conducted by leading regional media networks on the sidelines of the road show.